These are the simplest little snacks but I guarantee you’ll be able to eat dozens of them. This is really more of an idea than a recipe so feel free to experiment with this. Look for big blocks of haloumi in delis and places that stock Middle Eastern and Greek cheeses. 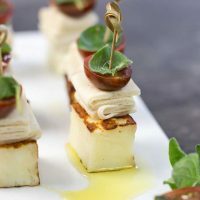 You may have served fried or berbecued Haloumi before but adding the extra bits just makes them a little more filling. Serve with a grating of black pepper and lemons to squeeze as well as a drizzle of olive oil. I like my tomatoes with a little sprinkling of sea salt too. You can find Greek Pita bread in a lot of fruit stores. It is a soft round bread, thin as Lebanese bread but more spongy and soft like the bread you get on a Yeeros ( kebab). 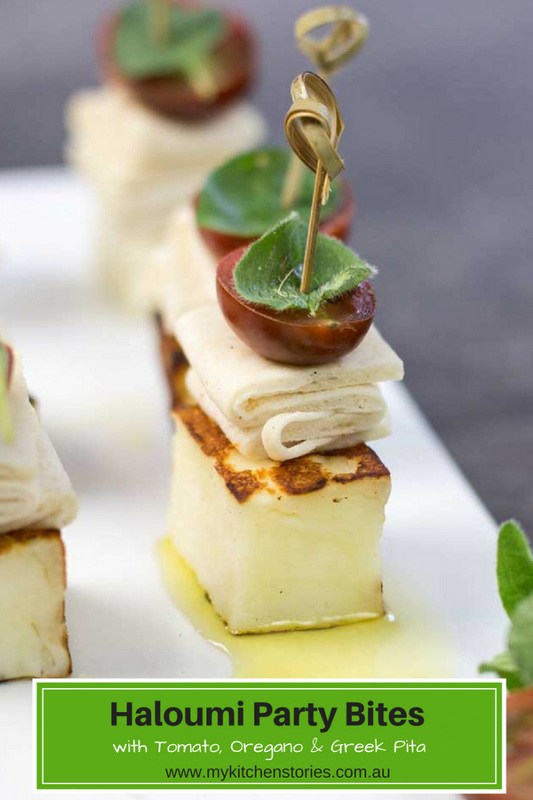 Cut the haloumi into thick 3 cm / ¾ in pieces x 5 cm / 2 in long. Try to make them all even and square bottomed so they can sit up straight. Pick the leaves and set these along with the halved tomatoes and toothpicks aside, ready for use. Put a fry pan or skillet onto the heat. Let it get quite hot before adding a small amount of olive oil. Swirl it around then add the haloumi . Cook all four sides till golden turning as each reaches the right colour. Take them out and put onto a plate. Make one at a time. Fold the Greek bread into a concertina then put the tomato onto the top and spear it with a leaf and the toothpick. Serve with a drizzle of olive oil and some lemon wedges. This recipe appears in my E-Book. It’s free to all new readers just enter your email address to get your copy. Yum! They look adorable and tasty. Yum – delicious. although I’d have to use a stick to keep my daughter from these, she loves haloumi! These party bites do not only look amazing but they must be tasting delicious, Tania. Can I use dried oregano for this recipe? How pretty…they would be a perfect bite to have on New Year’s Eve. 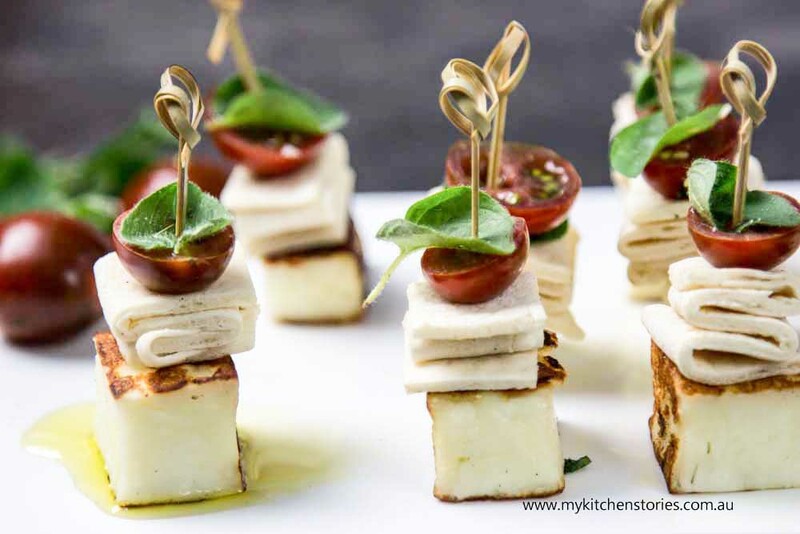 I adore haloumi, that fresh squeek against your teeth when you bite into it and the fresh flavour. Pairing it with a little Greek bread and the tomato and oregano sounds delicious. I wish you all the best for 2018, with health and much happiness. These look very healthy and yummy! Thank you for sharing such an easy recipe! Yummy just loved the food you are giving..